Industrial moving specialist MJ van Riel has used an Enerpac SL300 hydraulic gantry to install a sheet metal press brake in a low height building. The press brake was in two parts, each weighing 32,500kg and measuring 5.06m(L) x 2.86m(W) x 4.11m(H). To cope with the limited working height, MJ van Riel used a low loader to transport the press brake into the factory. 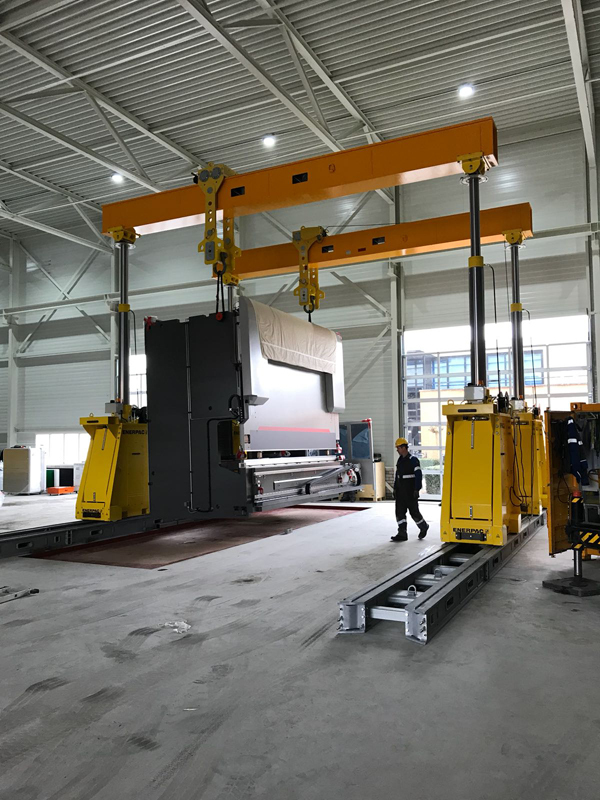 Equipped with two stage lifting cylinders for loads up to 3000kN, the SL300 gantry and header beam’s electric powered side shift unit lifted and positioned each press brake. Intellilift wireless remote control for unobstructed views of the load, and accurate positioning of the press brake. The SL300 ensures automatic synchronization of lifting with an accuracy of 25.4mm and automatic synchronization of travel with accuracy of 15mm.